I'm the guy that likes to abuse my RAID arrays, described here and here. So this success with CacheCade Pro 2.0 is that much sweeter, even if it took about a year and a half to fully bake. This vZilla project, which inspired me to start this web site on June 1 2011 in the first place, was in jeopardy of having a failed storage strategy. 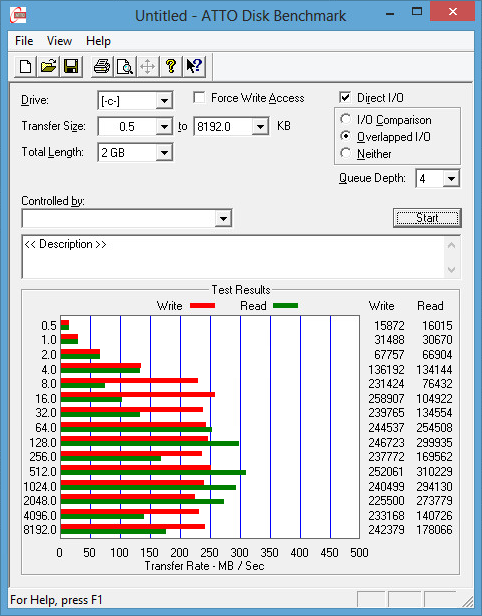 Without CCPro2 for SSD caching of my 5.6TB RAID5 array, I could obtain similar speeds at a much lower price than my LSI 9265-8i. But victory at last achieved last night, with initial tests indicating a favorable outcome. Stay with me here to the end of this saga, where you'll see some initial benchmark tests, and rather impressive results! Z68 Sandybridge Motherboard VT-d Test Matrix: Which Mobo/CPU combo works with VMware ESXi 4.1U1 VMDirectPath feature? Basically, I'd format the entire internal RAID5 array as one big 5.6TB VMFS storage device in ESXi 5. I'd then put my VMs on that array, which would hopefully perform quite well, especially upon performing procedures the 2nd and 3rd time (for caching effects to start helping). LSI CacheCade Pro 2.0 / FastPath FAQ has arrived, and so have the 30 day trial keys! I removed the old key, which made my array Foreign, and not import-able. In other words, I should have done the wise thing, which would have been to disable CacheCade Pro 2.0 in the MegaRAID UI before shipping it in for exchange, oops! which I'm frankly not as interested in as real-world use and home-brew tests I'll be doing that are meaningful to me in my configuration. But I do take from it that I should look at the effects of moving the queue depth higher, with results seen below. The Intel and other well-known-brand models they do list tend to be enterprise centric (pricey), naturally. It's not "normal" for home-build virtualization enthusiasts to use these for single-user storage labs. But the interoperability list has grown considerably since last summer, back when I met a LSI engineer at VMworld 2012 in San Francisco, discussing this whole matter at length. 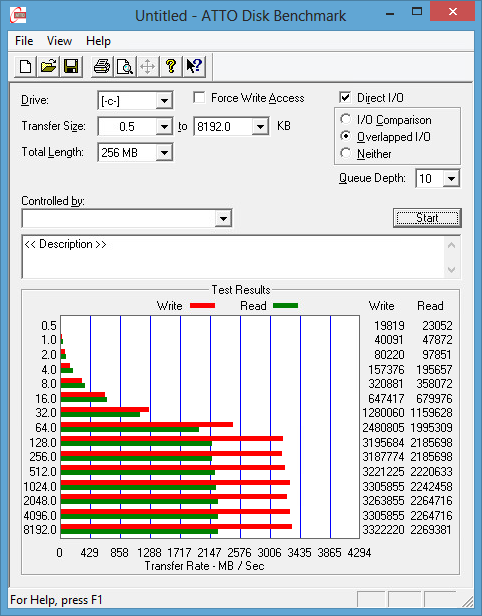 Thin provisioning on the RAID5 array versus Thick Provisioning seemed to have no effect on performance of ATTO Disk Benchmark, at all. Looking backing, if I were buying a caching RAID controller today, things would likely only change a little. 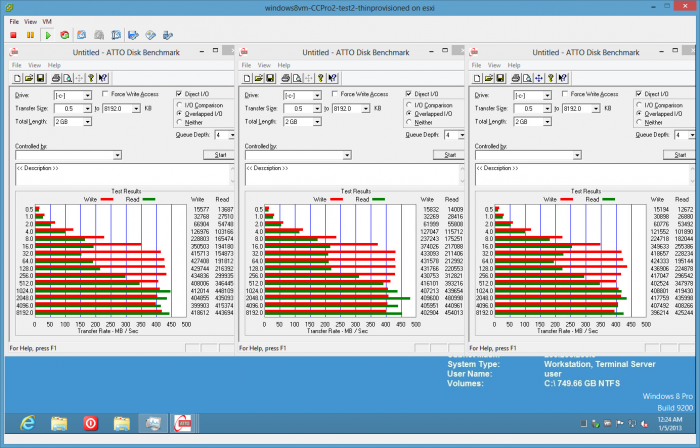 Adaptec MaxCache 3.0 has come along to compete with LSI CacheCade 2.0 Pro, for example. has this read and write caching, and supercapacitor based Zero-Maintenance Cache Protection. 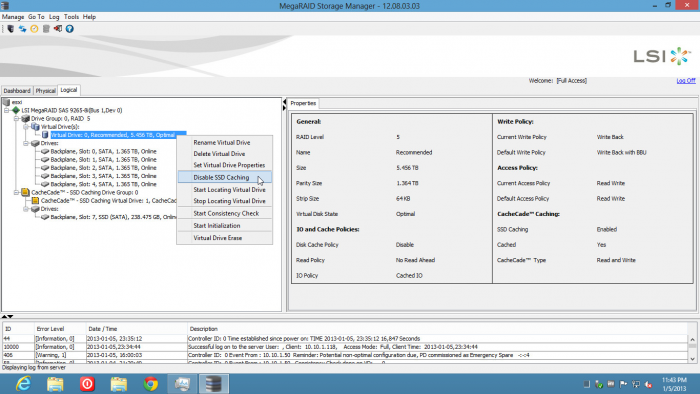 Such supercapacitor protection is on the LSI 9286CV-8eCC as well, called MegaRAID CacheVault Flash Cache Protection. 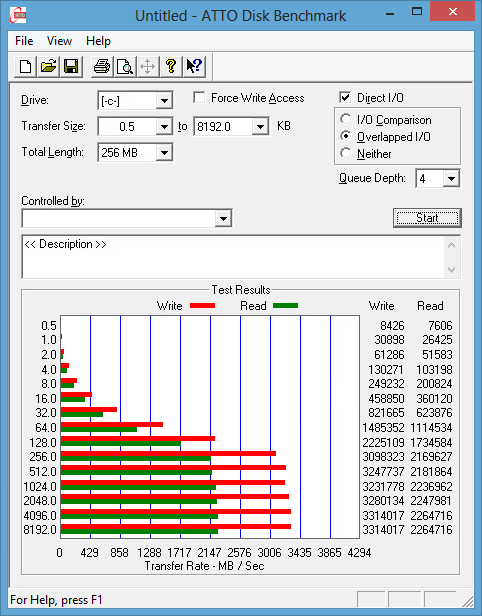 But that unit still has the same performance as my 9265-8i, using the same LSISAS2208 Dual- core 6Gb/s ROC - x2 800MHz PowerPC Processors. The bus speed is boosted, with with my modest needs and overall throughput, I really doubt I'd notice any difference in my speeds. In the end, it appears I'm not missing out on some amazing speed boost at a lower price. So no regrets. 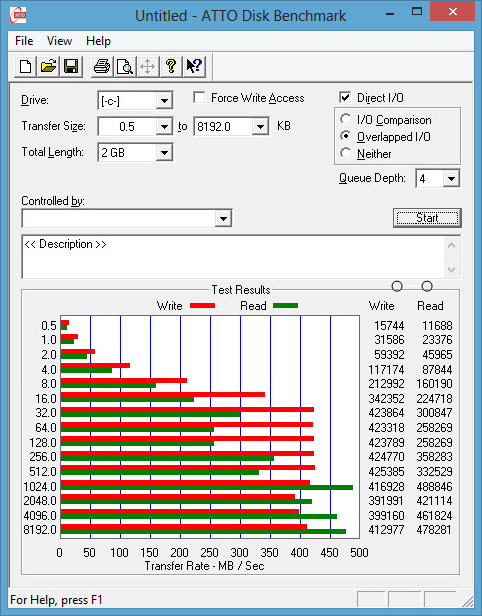 And if I were starting all over today, I'd likely evaluate the Adaptec 7805Q against the 9286CV-8eCC first hand, using a bunch of benchmarks and real-world usage to determine my actual speeds seen during day-to-day home lab usage. 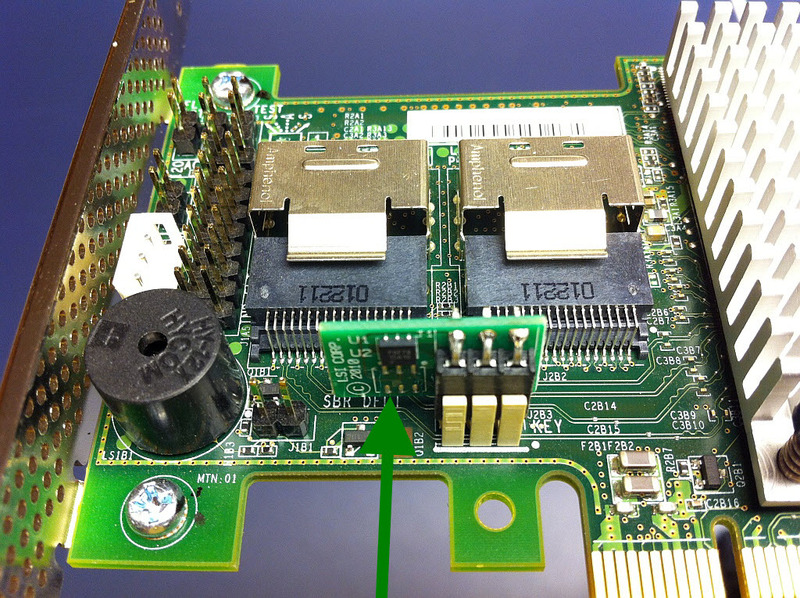 Anyone have any thoughts on the newer Adaptec RAID adapters?